To create this delicious brownie recipe, I looked to my favourite recipes and chose Chef Michael Smith’s brownies, and added a couple ingredients from Ina Garten’s version of it. I love her choice of adding coffee granules, which helps cut some of the sweetness. 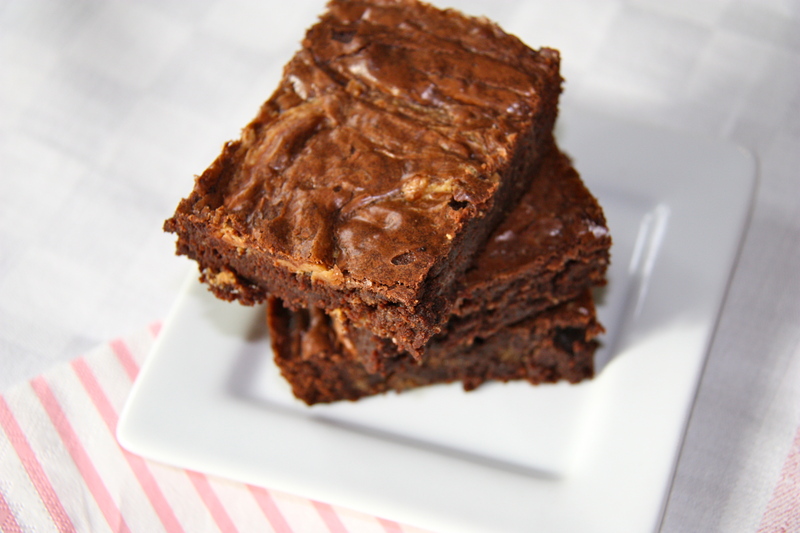 These brownies are a great dessert to bring to any party. Preheat oven to 350 F. Prepare a 9x13 inch pan. Grease the pan with butter or cooking spray. In a large bowl, whisk together the flour, baking powder, cocoa powder, and salt. To melt the chocolate and butter, prepare a pot over medium low heat filled with 1 cup of water and bring to a simmer. Place a heat proof bowl on top. Add the chocolate and butter and using a wooden spoon stir the chocolate and butter until it is melted and combined. Let the mixture cool momentarily. Once the chocolate mixture has cooled, whisk in the eggs, vanilla extract, and coffee granules to combine. Add the flour mixture to the chocolate mixture and mix to combine. For the swirl, combine all of the ingredients in a bowl. Pour the brownie batter into the prepared pan. To form the swirl, spoon globs of the peanut butter mixture into several areas of the brownie mix. Using a knife, mix the peanut butter into the brownie mix, forming a swirl design. Bake in the oven for 25-30 minutes, until a toothpick inserted comes out clean. Cool and slice into squares. Serve and enjoy!